The average consumer in India doesn't like to spend too much time in pondering over the decision to buy a phone. Once the budget has been set, the phone should be selected. Thanks to the rate of advancement in the smartphone space in the past few years, we are spoilt for choice. There are way too many smartphones out there - with different Operating Systems, with different feature sets and different design directions. Despair not, for we at The Indian Geek, have tried to distil the key smartphones from each manufacturer within a specific budget. * We have only considered smartphones from manufacturers who sell their own phones (as opposed to several companies that sell re-badged phones made by Original Device Manufacturers - ODMs - in China or elsewhere). This means that we have considered (in alphabetical order): Apple, Blackberry, HTC, LG, Nokia, Samsung, Sony. Motorola did not make the cut as their sales operations in India have been ceased. * This is not a specs comparison. There are websites such as Versus IO that can do a much better job at comparing specs between multiple devices. * The Indian Geek does not deal with the sale of any of these products. 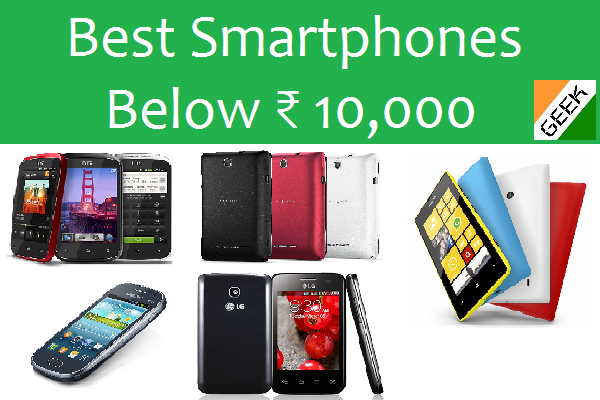 Now that we have dispensed with the formalities, click the 'Read more' link below to see our picks of the best smartphones below ₹ 10,000 in India, as of August 2013. The Desire C is one of the two phones in our picks here which does not have dual-SIM functionality. For us, that's not a dealbreaker; but for the average Indian smartphone buyer (in this budget), that could very well be a turn-off. The phone has decent construction, a 5 MP rear camera and HTC's strengths such as Beats Audio and Sense UI going for it. Sadly though, since this phone was released in 2012, it is stuck on Android 4 (Ice Cream Sandwich) with a 600 Mhz processor. We definitely cannot recommend the HTC Desire C to anyone, although if you must own an HTC smartphone and your budget is below ₹ 10,000 then this is the smartphone to buy. Otherwise, we'd highly recommend that you either increase your budget by three or four thousand rupees, or look at other options in this list. This large-screened entry-level smartphone from LG appears to tick all the necessary boxes for entry-level Android smartphones which run the Android 4.1 (Jellybean) Operating System. It's also the only smartphone we know of, which has a SIM-switch key right next to the usual capacitive buttons for navigation within Android. The Optimus L4 II has the distinction of being the only smartphone in this list which has a display (3.8 inch, 320 x 480 pixels) that we are not happy about. The lower priced Optimus L3 II is worse, with a 3.2 inch QVGA (240 x 320 pixels) display. It is definitely better than last year's E612 which had a 4 inch HVGA (320 x 240 pixels) display. If you're a die-hard fan of LG, and you wish to stick within your budget of ₹ 10,000, then by all means buy this smartphone. Else, look elsewhere within this list or increase your budget. Windows Phone and iOS smartphones are generally frowned upon by the general public for being less spec-heavy than similarly priced Android counterparts. If that's your line of thinking, the Nokia Lumia 520 will make you think again. This is the only smartphone in this list of smartphones below ₹ 10,000 which has a 1 Ghz dual-core processor, a WVGA (480 x 800 pixels) display, a 5 MP camera that can shoot HD (720p) video and 8 GB ROM. Unfortunately, this would also be one of the most undervalued smartphones in this line-up, simply because it runs Windows Phone. Windows Phone 8 by itself, has nothing wrong within. Microsoft 'fixed' many crippling issues that made Windows Phon 7.x barely usable. Windows Phone also means that the Lumia 520 is one out of the two smartphones in this line-up which does not have dual-SIM functionality. If you must have dual-SIM, then you'll have to look elsewhere. Same story with the apps: if there are certain apps that you desperately must-have which aren't available on Windows Phone, you're stuck with Android in this budget. Otherwise, the Nokia Lumia 520 is an excellent buy in this price range right now. Samsung has conquered the Android and smartphone realms in the past few years, and it's definitely due to the sheer volume of devices that the company seems to output every year. For this listing, we had a difficult time choosing a clear winner from Samsung for this budget, but the Galaxy Fame narrowly made the final cut. In its favour, the Galaxy Fame has a front camera (the only smartphone in this list to have one) and a 5 MP camera. Apart from that, it ticks all the necessary boxes for Android smartphones within this budget. What we still are unhappy with Samsung for is the fact that the design of their smartphones right from the cheapest to the costliest is basically the same, and does not leave a great feeling in our hands (when compared to the competition). Also, the Touchwiz user interface (the skin that Samsung applies on top of the Android base) is still quite cartoonish. These could be overlooked if you want to buy a phone from the manufacturer that has sold the most number of Android smartphones till date, but that would have to be a personal choice. Sony has attacked the Android smartphone market with a renewed strategy that is appropriate for the market in many ways. Their 2013 crop of Android smartphones have a phone within ₹ 5,000 price range of each other - Xperia E, Xperia M, Xperia L, Xperia SP, Xperia ZR, Xperia ZL, Xperia Z, Xperia Z Ultra. Each phone differs in size, design, considerable features while maintaining a standard build quality all around. The Xperia E/E Dual is the only phone within the Sony 2013 line-up which still has capacitive buttons. While the Xperia E/E Dual manages to 'tick' all the necessary boxes for an Android smartphone within this budget, there is nothing exciting or new that it brings to the table. If you wish to purchase a smartphone running Android 4.1 (Jellybean) within this budget with good build quality and the base specs, you will find the Xperia E/E Dual a worthy contender for your money. Thanks for listing out these phones, i am planning to buy smartphones and these are in my budget.